This Land Cruiser is one that finds its courage in contrast and bold details. It is red and black, classic and modern — an FJ40 custom-built for casual driving in the Rocky Mountain town of Aspen, Colorado. Our client bought this Land Cruiser from a friend in Aspen and sent it to us for a contract restoration. We gave her weathered warrior a fresh start, perfecting its original armor and reviving every classic detail. 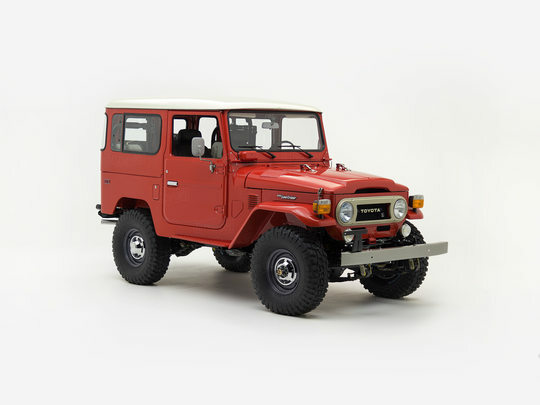 Its iconic looks invigorated with a bold shade of Freeborn Red (109), a rugged set of 33” tires, and shiny Toyota hubcaps. This Land Cruiser’s classic powertrain is the stuff of legend. And at the heart of it all - the Toyota 2F engine. Here, that ever-formidable classic has been completely rebuilt and fine-tuned for casual driving. A smooth shifting 5-speed and modern running gear, further refine the ride. Splendor is the kind of word you might reserve for the majesty of the Maroon Bells, but here, in this FJ40’s cabin, it finds new meaning in tailored seats, throwback controls, and digital sound - the perfect companions for a not-so-everyday drive.